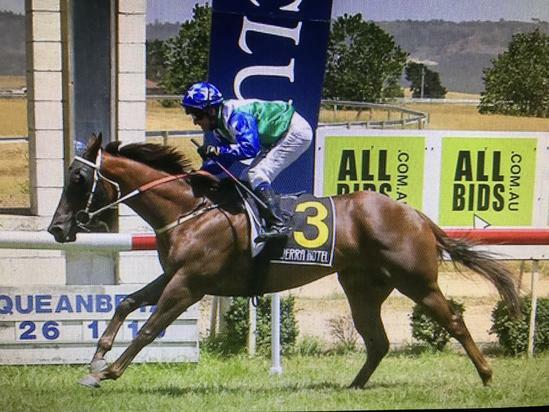 4 year old son of Stallion Excites, "Neptune" has broken his Maiden win at Queanbeyan on 26 January 2019 in the 1200 metre race. The track was rated a good 3 and John Grisedale took the ride, jumping from barrier 4, carrying 57.5 kilograms. The barriers opened and Neptune jumped very well. With some encouragement from John, Neptune was able to gain a leading position on the rails from the rest of the field. Neptune went along at a genuine clip for the race but was seemingly settled enough into his run. Neptune was able to steadily increase his lead from the rest of the field as they approached the turn into the straight by about 3 or so lengths. At the turn, he was the horse to run down. However, he continued his impressive and dominant run down the straight and was not able to be out run securing his Maiden win by nearly 3 lengths to Pepita in 2nd and Illinois Guru in 3rd. Thank you John Grisedale for a confidently calm ride. We would like to extend our congratulations to Neptune's owners. This was a great win for all at the stables. Neptune is a very well-liked and kind natured horse around the barn and we hope that we can see many more wins from him. Photo courtesy of Lance Ferne Photography.